So, recently I completed Crossfit open 18.2. I am by no means a Crossfit athlete or affiliate in anyway but I do enjoy the workouts. For the official details of the workout check online at the official Crossfit Games website. This is just a quick summary and review of my personal experience as a fitness professional being provided for my clients. The workout is broken into two sections: 18.2 and 18.2a. 18.2 involves 1,2,3,4,5,6,7,8,9,10 repetitions in a ladder fashion of Dumbbell Squats with two 50 pound Dumbbells and Bar-Facing Burpees. 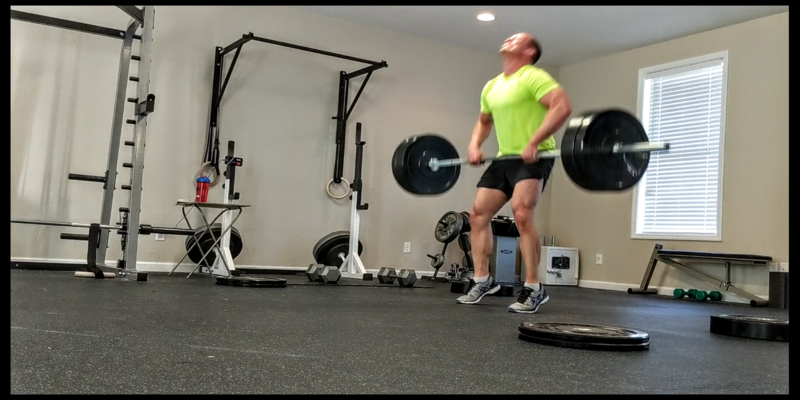 18.2a is a 1-rep max clean. In total it is 110 Burpees and 110 Squats. 18.2 and 18.2a must be complete in 12 minutes. Attached is a video clip of my last round of 10 and clean. Honestly, I made terrible decisions related to sleep and nutrition the night before and I feel like my performance was negatively impacted. Basically, I completed the Squats and Burpees in around 10 minutes and due to personal reasons only cleaned 185 pounds. Basically, I knew my time was terrible and there was no reason to kill myself. I will probably repeat the workout. I feel like with proper sleep and nutrition I can reduce my time at least 1 ~ 1.25 minutes and should be able to clean at least 225 lbs. That will put me in about the top 30~40% of RX’ers or people who complete the workouts as prescribed. I am not a Crossfitter or trying to compete. My main goal is understand current fitness standards and trends in order to provide the best coaching possible to my clients by helping them improve their personal fitness levels as safely and effectively. That said, I am totally cool with my times. So, it was a lot of burpees and squats in a short amount of time. It was very challenging and I was certainly tired at the end. I actually enjoyed it! It is like a 300 calorie burn in about 10 minutes. Then throw a 1 rep max clean in on top of it once you are good and tired. For people new to this training style it is a bit much. In college while obtaining my B.S. degree in Health and Human Performance coaches taught these Olympic lifts over the course of about 12 weeks. Typically, I only perform complex Olympic style lifts when I am completing Crossfit workouts. I would not prescribe these exercises for any of my clients that are new to this fitness training style. The benefit simply does not justify the risk and I am able to maintain my fitness level and keep up with most people without them. Feel free to ask any questions you may have in our HIIT Transformation Class.